Curve 2, Other Virtual Synth from Cableguys. 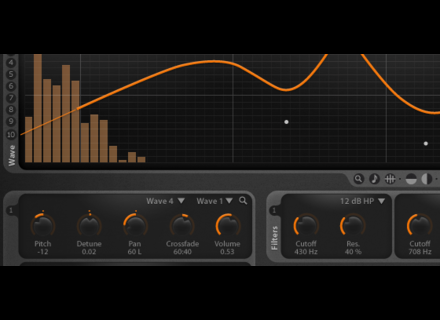 Cableguys has announced Curve 2 and that if you buy Curve 1 now you'll get version 2 for free. Enhanced Audio: Curve's drawing of waveforms for its aliasing-free OSCs and LFOs brought unique sounds, the company says. Version 2 adds drawable envelopes, allows for two waveforms per OSC and adds a unison mode. Expanded Preset Library: Curve's preset library is a shared online database. Version 2 helps sharing sounds by adding a version history, author and preset descriptions. Improved Usability: On user request, Cableguys have changed the color scheme. Version 2 brings a new layout, and adds MIDI assignment. The public beta for Curve 2 will start in Q1/2012. If you purchase Curve 1 or the Cableguys Bundle now, you'll get get the upgrade to Curve 2 for free. KV331 Audio Synthmaster 2.5 Updated KV331 Audio has updated SynthMaster to version 2.5.4.126 on both Windows and Mac OS X platforms. gbTouch 3.1, gbRemote 1.1 Apps Available Harmony Systems announced the availability of gbTouch 3.1 and gbRemote 1.1 upgrades to their iPad and iPhone music controller applications. Guitar Pro Extended Edition Guitar Pro Extended Edition is a boxed set limited to 500 copies with a range of branded Guitar Pro accessories.